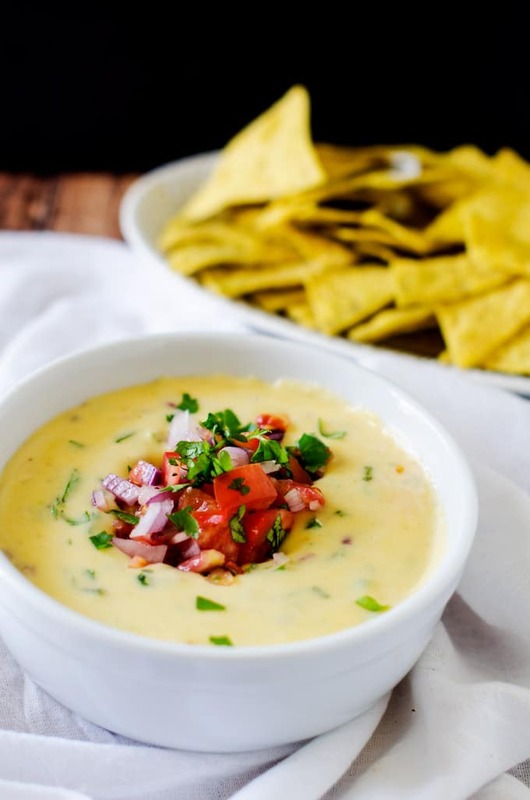 This easy to make Homemade Queso Dip is packed with flavor. 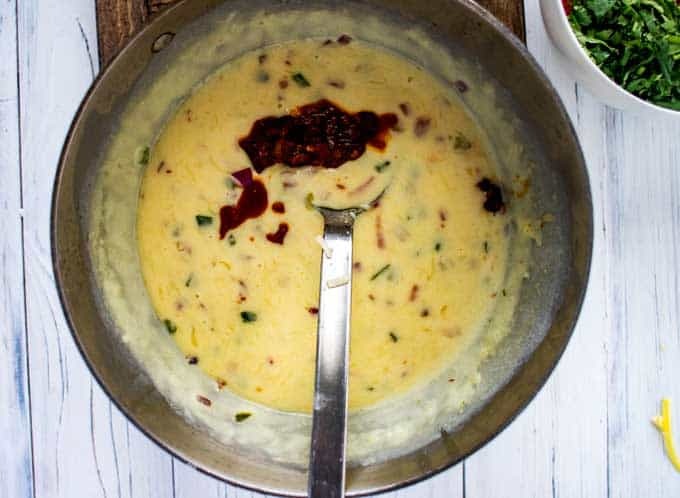 With red onion, tomatoes, cilantro and jalapeños combined with pepper jack and sharp cheddar cheese, you’ve got a delicious cheesy dip that will be a crowd favorite. Confession: I like football, but I LOVE football food. I get excited whenever a big game roles around and it is time to plan the menu. First up: something cheesy, comforting, and totally indulgent. But just because we are indulging for a big night, doesn’t mean we have to whip out the processed cheese. Seriously, have you ever read the ingredient list? Um, thanks, but I’ll pass. Instead, I like to stick with real food, like today’s Homemade Queso Dip. 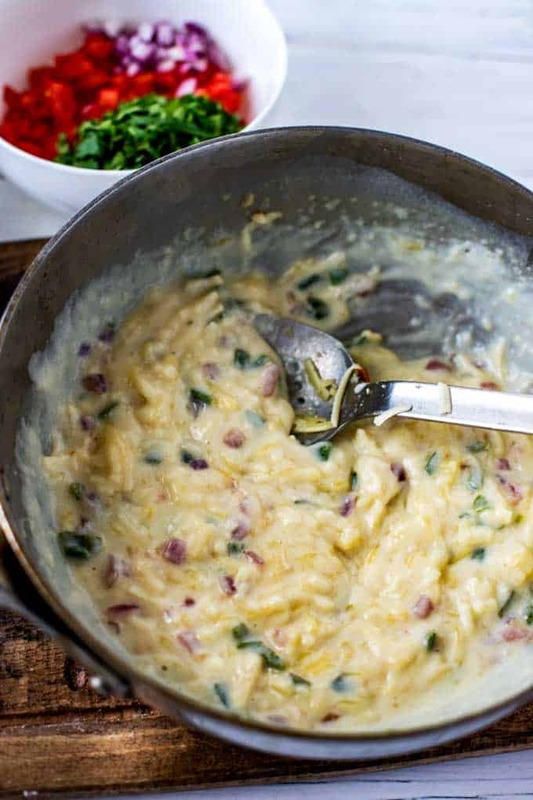 This splurge-worthy dip is packed with flavor. You can serve it with gluten-free (and preferably organic) tortilla chips, but I also love it drizzled over veggies. I limit the peppers so that the boys will eat it, but if you are serving just adults feel free to add more. Another alternative for a kick of heat, is to add in a finely chopped chipotle chili pepper at the end. Two if you really want to spice things up! That is what I do when I am making it for grown-ups only. Sometimes I will even make a hot batch and a milder one. Speaking of making two batches, this dip doesn’t make a ton. This is intentional – this isn’t the kind of thing I want to have leftovers of because you-know-who (me) will hide it under the kale and save it all for herself. So if you are entertaining a crowd, you may want to double the recipe. 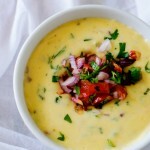 I like to keep this Homemade Queso Dip warm in a slow cooker or even a fondue pot. (If you happen to be like me and still channel the 70’s with fondue night now and then.) It is definitely best served warm. First you need to gather your ingredients. 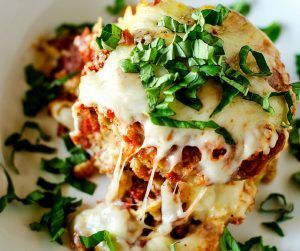 You will need olive oil, milk, grated cheddar and pepper jack cheese, red onion, chopped jalapeno and serrano peppers, cilantro, tomato, gluten free flour and salt. Heat oil in a pan and add the remaining red onion, peppers and salt. Cook for about 5 minutes, until tender. Add the flour and cook for another minute, stirring often. Whisk in the milk and bring to a simmer. Cook for about 5 minutes, until the sauce begins to thicken. Add the cheese and cook over low heat until the cheese is melted. Stir in Cilantro and if you want a little heat, add a diced chipotle chili pepper. 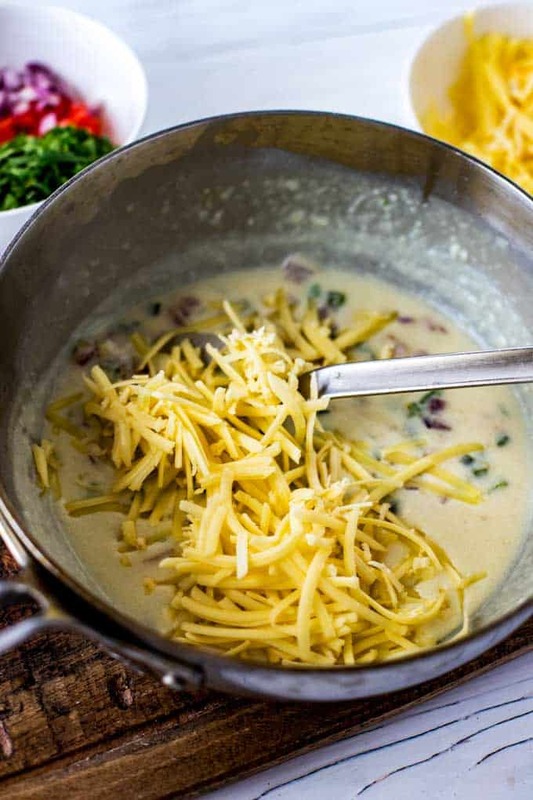 How do you make queso with meat? The easiest way to make meat with queso is to stir in 1/2 pound seasoned and browned ground beef or chorizo to the finished queso dip. What kind of cheese is in queso? 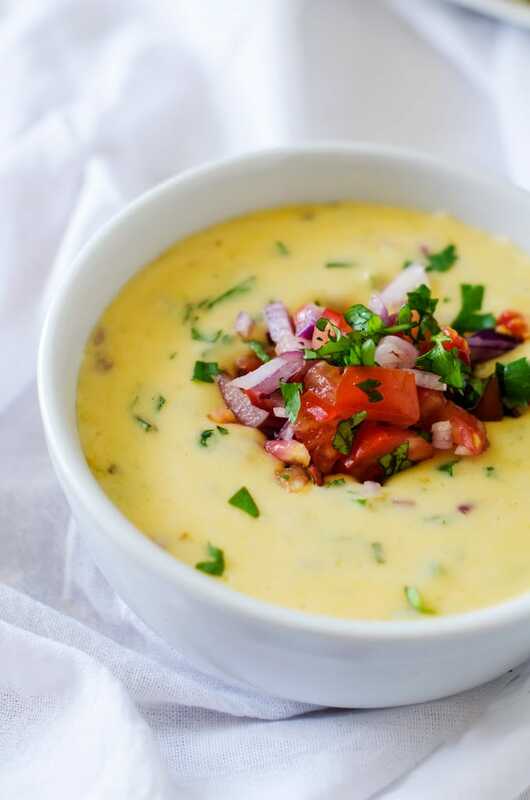 This easy to make Homemade Queso Dip is packed with flavor. 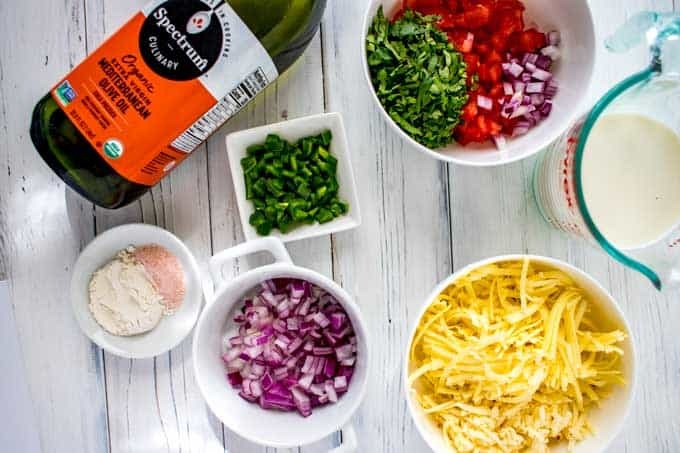 With red onion, tomatoes, cilantro and jalapeños combined with pepper jack and sharp cheddar cheese, you’ve got a delicious dip that will be a crowd favorite. 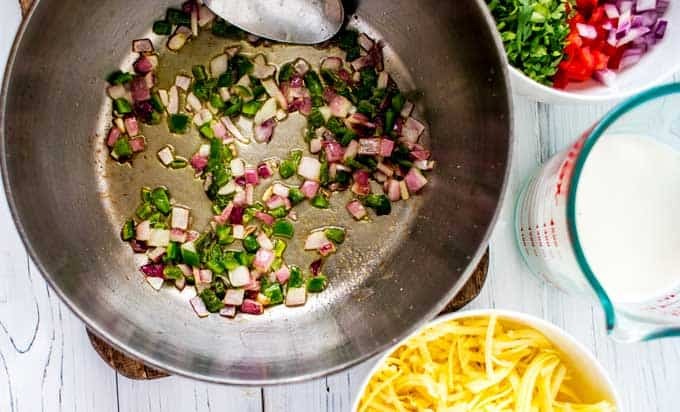 In a small bowl, combine 1 tablespoon red onion, tomatoes and 2 tablespoons of the cilantro. Set aside. Melt the olive oil in a medium saucepan over medium heat. Add remaining red onion, serrano pepper, jalapeño and salt. Cook for 5 minutes, stirring often. Sprinkle the flour over the mixture and cook for one more minute, stirring often. 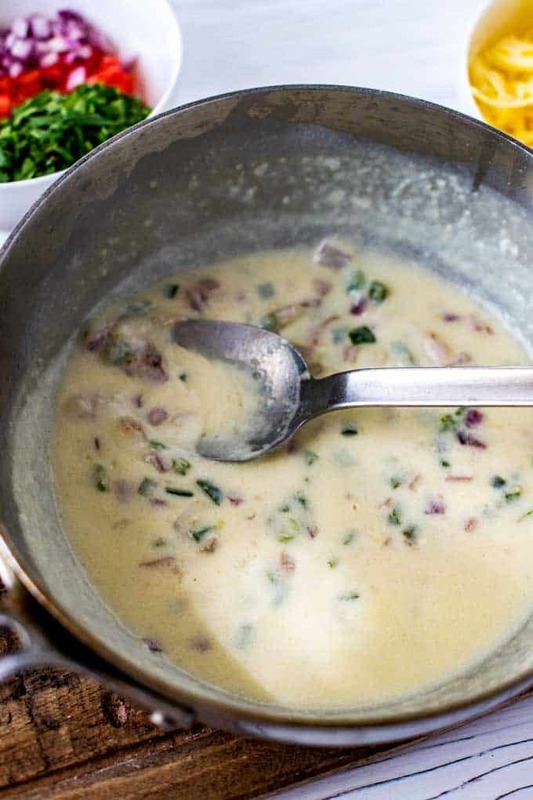 Whisk in the milk and bring to a simmer. Continue cooking for 5 more minutes, until the sauce starts to thicken. Add the cheese and cook over medium low heat until it is melted. Remove from heat and stir in cilantro. Transfer to a serving bowl and top with the tomato mixture. Serve warm with chips and vegetables. Top with a drizzle of Sriracha. Stir in 8 ounces of cooked and crumbled sausage. Add in a can of drained green chiles. Add in 7 1/2 ounces of fire-roasted diced tomatoes. 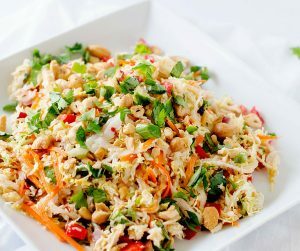 Cut up vegetables - Jicama, radishes, cauliflower, and celery are good options. If you have leftovers, pour them over a piece of toast. If you are serving a crowd, you will want to double this recipe. It doesn't make much to start with, and it is one of those things that goes very quick. 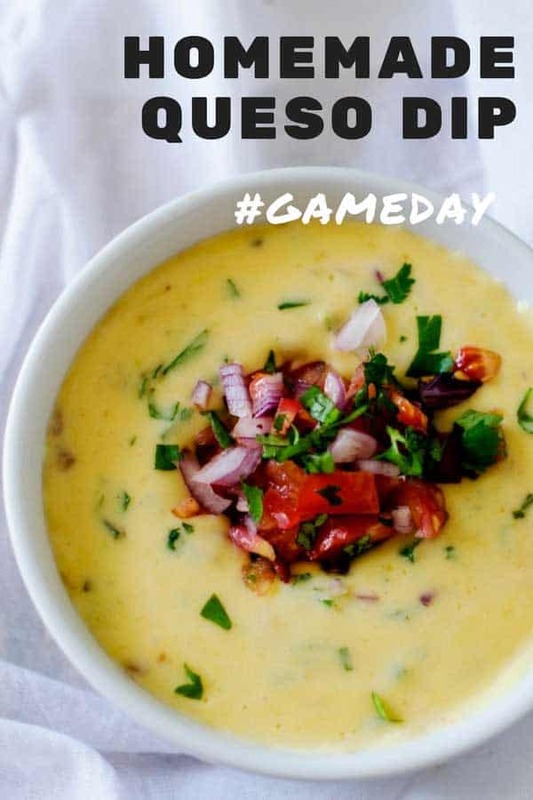 If we are having something as heavy as this Homemade Queso Dip on game day, we will very often do appetizers only instead of a traditional meal. This is seriously my favorite dip in the entire world. I am in love. Made from scratch with real cheese, not Velveeta. Fabulous comfort food on a rainy night. Need to have one of those soon! I love queso when we go to our favorite restaurant. How have I never made my own? I will definitely look into trying your recipe this weekend. Looks easy to make. I am pretty sure I can make this. Looks so good! I love the fondue pot. idea for this. I’m seriously considering to make this for a small party next week. Yum! I’m so excited to see a dip recipe that isn’t just fake cheese. I can’t wait to try to make this. 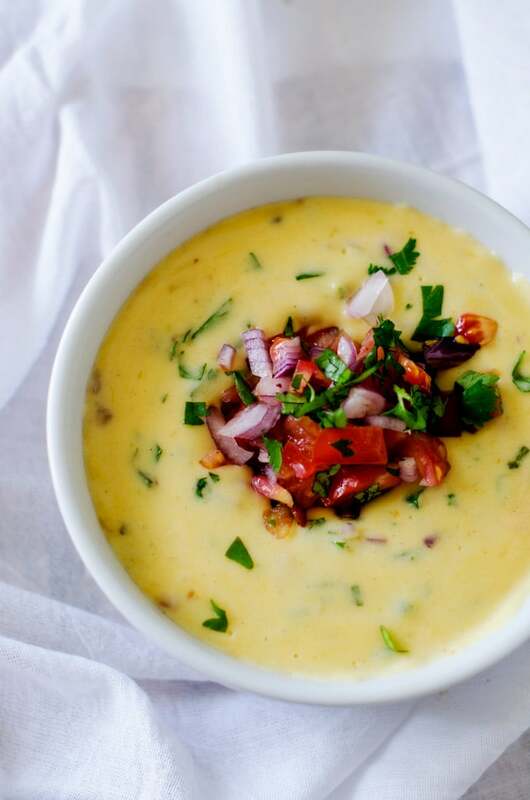 This queso dip looks so delicious! I need to make this! My favorite dip! Thanks for sharing such simple and nice recipe. It looks super delicious.